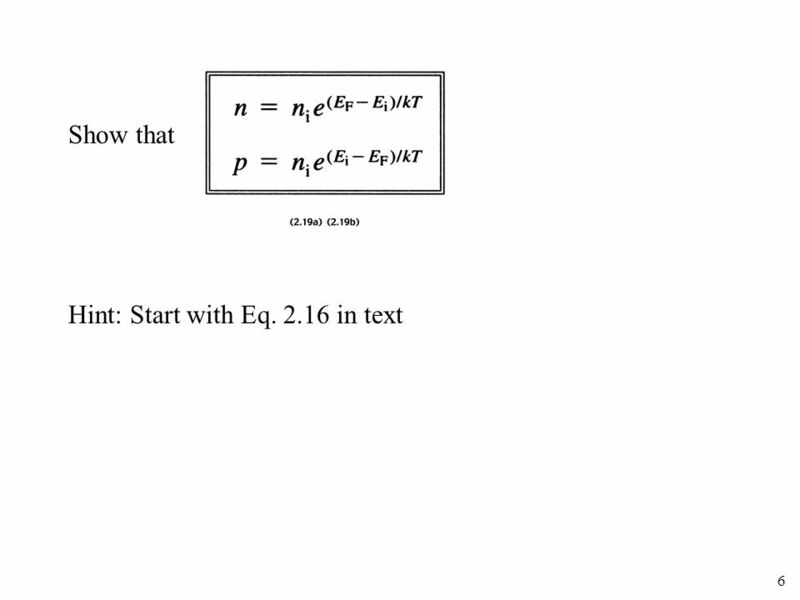 Read pages in text. 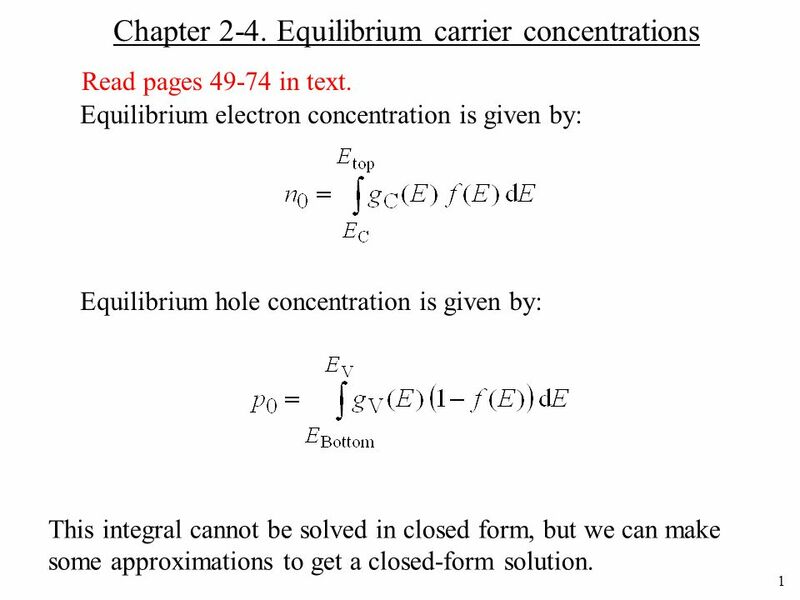 Equilibrium electron concentration is given by: Equilibrium hole concentration is given by: This integral cannot be solved in closed form, but we can make some approximations to get a closed-form solution. 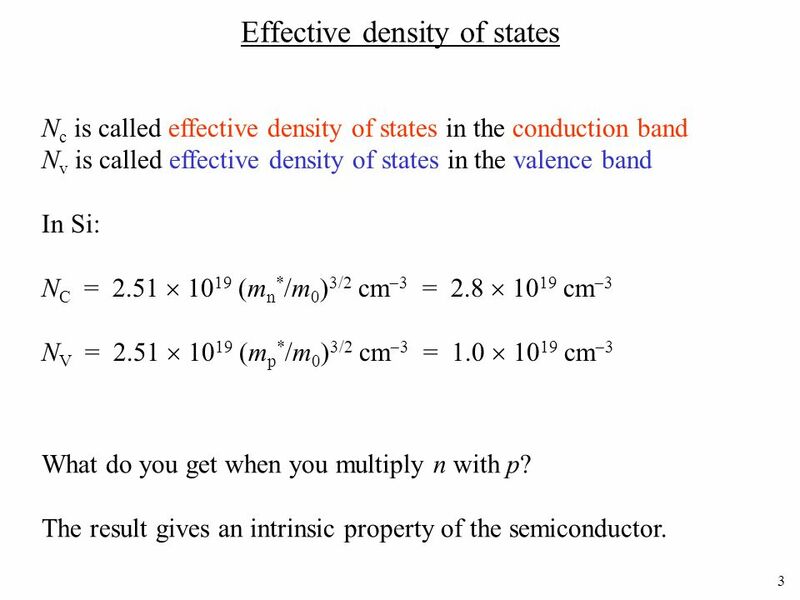 Nc is called effective density of states in the conduction band Nv is called effective density of states in the valence band In Si: NC = 2.51 1019 (mn*/m0)3/2 cm3 = 2.8  1019 cm3 NV =  1019 (mp*/m0)3/2 cm3 = 1.0  1019 cm3 What do you get when you multiply n with p? The result gives an intrinsic property of the semiconductor. 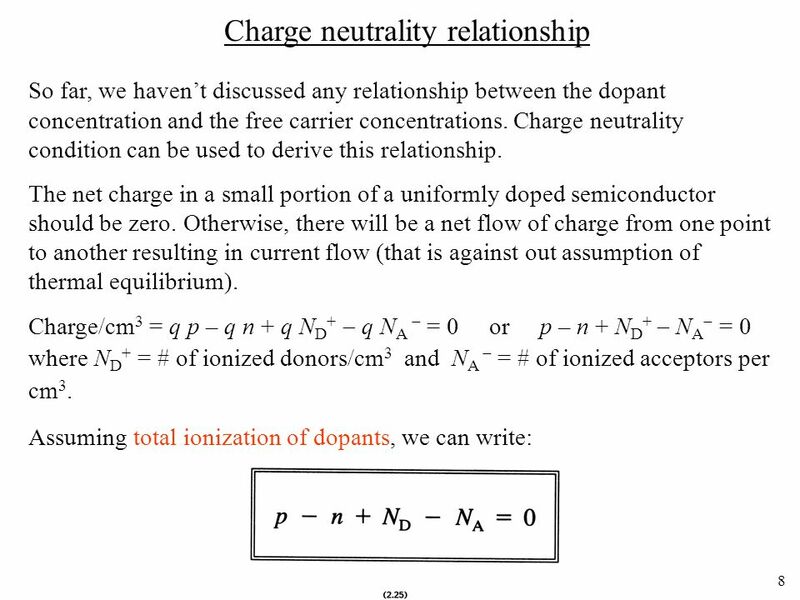 Assume a non-degenerately doped semiconductor and assume total ionization of dopants. Then, n p = ni2 ; electron concentration  hole concentration = ni2 p  n + ND  NA = 0; net charge in a given volume is zero. 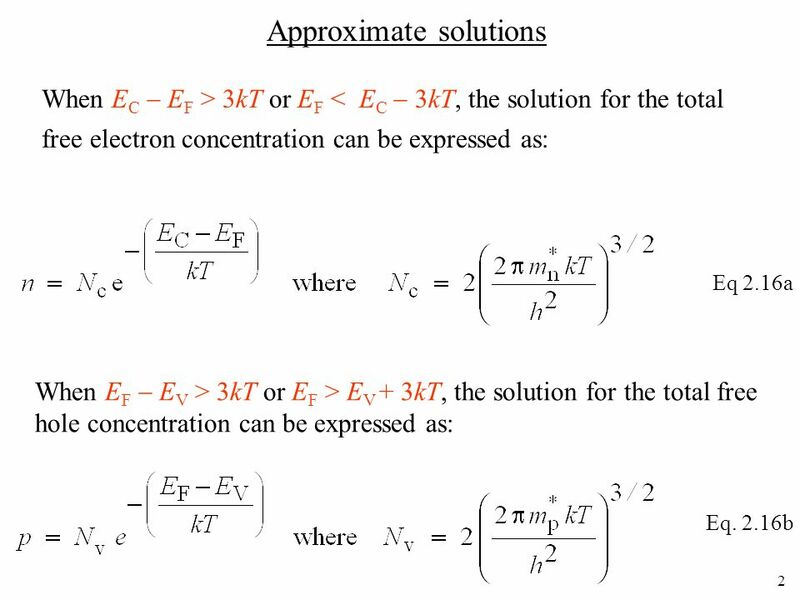 Solve for n and p in terms of ND and NA We get: (ni2 / n)  n + ND  NA = 0 n2  n (ND  NA)  ni2 = 0 Solve this quadratic equation for the free electron concentration, n. From n p = ni2 equation, calculate free hole concentration, p.
Doped semiconductors where | ND  NA | >> ni n = ND  NA ; p = ni2 / n if ND > NA p = NA  ND ; n = ni2 / p if NA > ND Compensated semiconductor n = p = ni when ni >> | ND  NA | When | ND  NA | is comparable to ni,, we need to use the charge neutrality equation to determine n and p.
13 Equations to remember Note: Our interest was in determining n and p. Free carriers strongly influence the properties of semiconductors. 14 Example 1 (a)	Consider Si doped with 1014 cm3 boron atoms. Calculate the carrier concentration (n and p) at 300 K. (b)	Determine the position of the Fermi level and plot the band diagram. 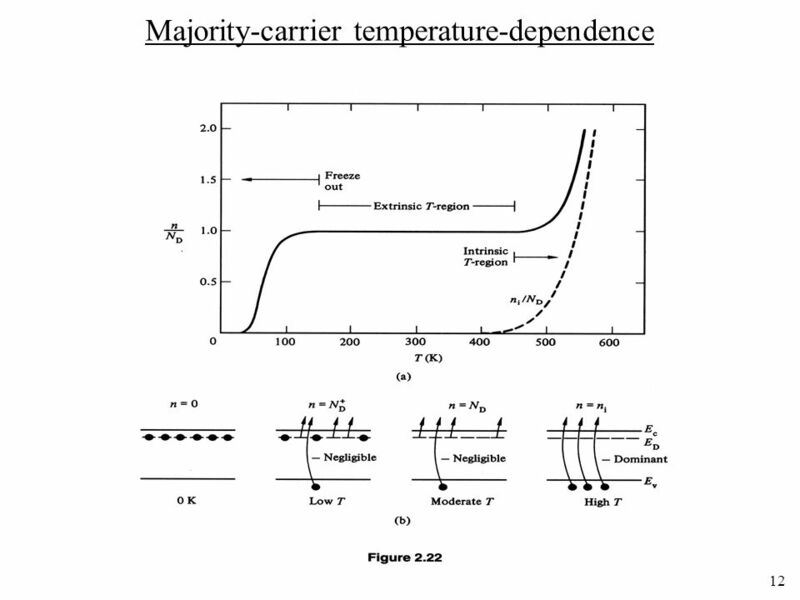 (c)	Calculate the the carrier concentration (n and p) in this Si material at 470 K. Assume that intrinsic carrier concentration at 470 K in Si is 1014 cm3. (Refer to figure 2.20). 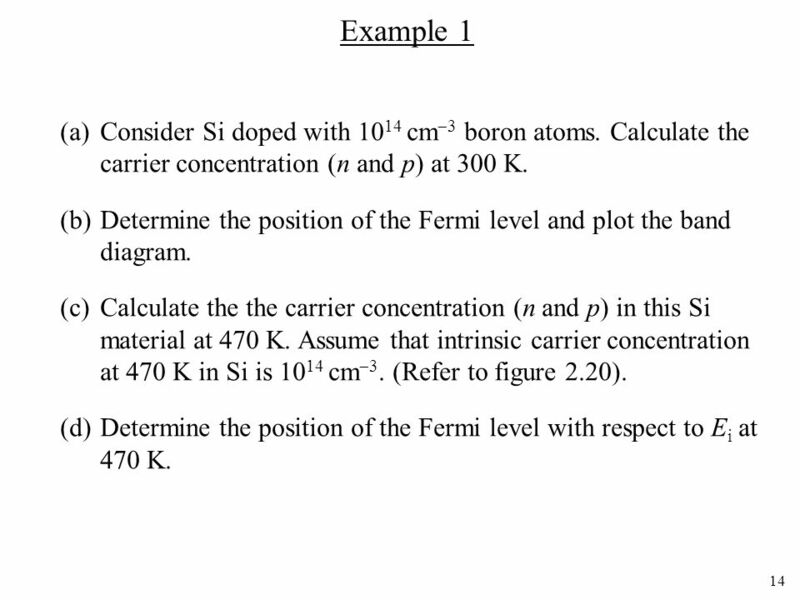 (d)	Determine the position of the Fermi level with respect to Ei at 470 K.
15 Example 2 Consider a Si sample doped with 3  1016 cm3 of phosphorous (P) atoms and 1016 cm3 of boron (B) atoms. (a)	Is the semiconductor n-type or p-type? 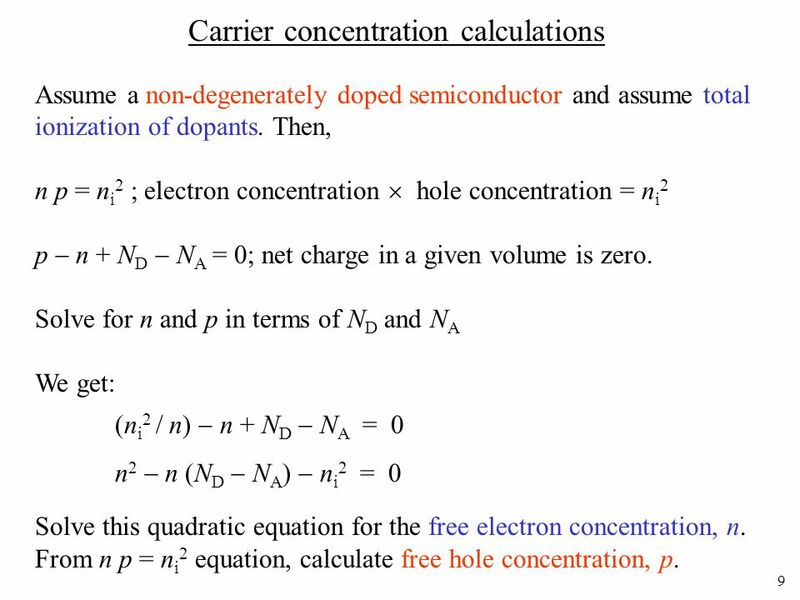 (b)	Determine the free carrier concentration (hole and electron concentrations, or p and n) at 300K. 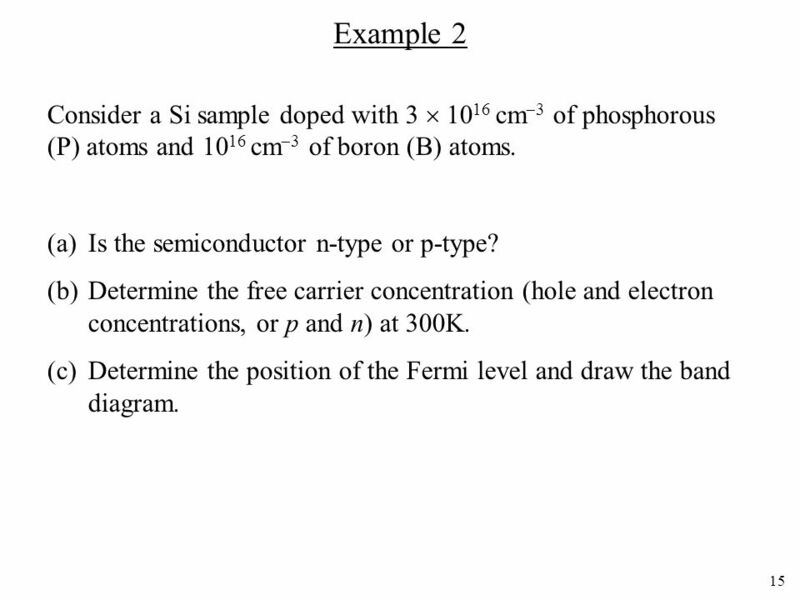 (c)	Determine the position of the Fermi level and draw the band diagram. Download ppt "Chapter 2-4. 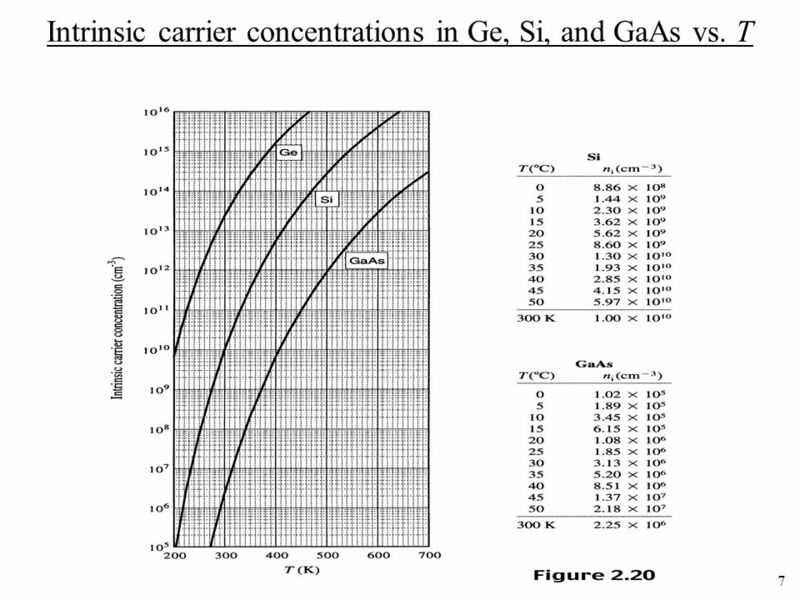 Equilibrium carrier concentrations"
1 Chapter 5-1. 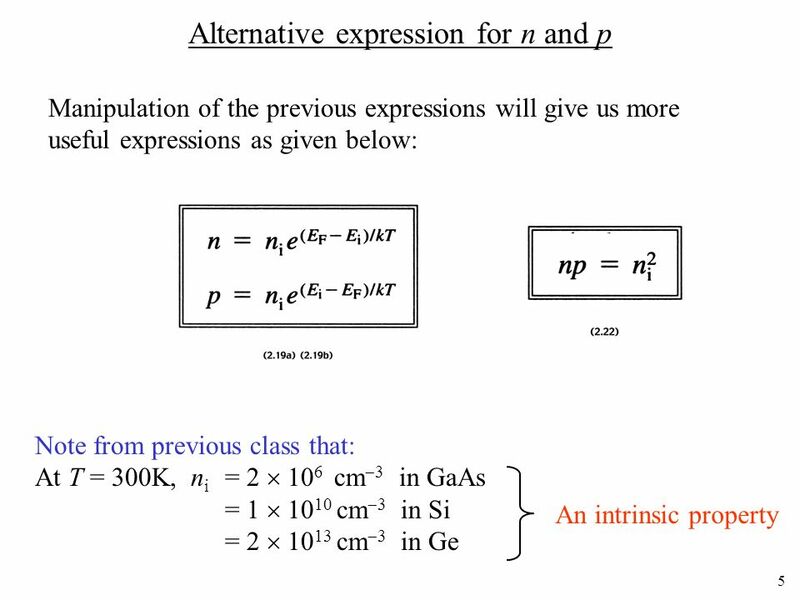 PN-junction electrostatics You will also learn about: Poisson’s Equation Built-In Potential Depletion Approximation Step-Junction Solution. EE130/230A Discussion 2 Peng Zheng. 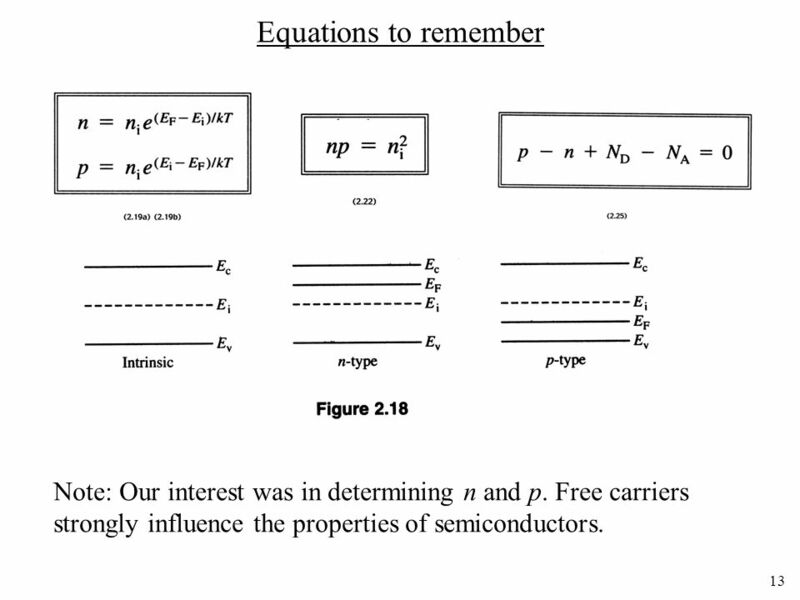 Lecture #5 OUTLINE Intrinsic Fermi level Determination of E F Degenerately doped semiconductor Carrier properties Carrier drift Read: Sections 2.5, 3.1. Semiconductor Device Physics Lecture 3 Dr. Gaurav Trivedi, EEE Department, IIT Guwahati. Lecture 2 OUTLINE Semiconductor Basics Reading: Chapter 2. 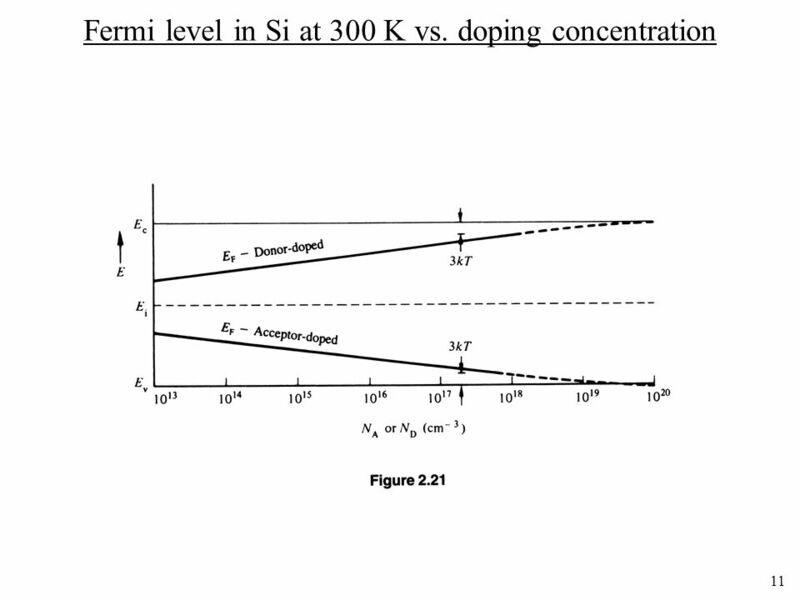 EE105 Fall 2007Lecture 1, Slide 1 Lecture 1 OUTLINE Basic Semiconductor Physics – Semiconductors – Intrinsic (undoped) silicon – Doping – Carrier concentrations.